There were lots of gorgeous looks at Sunday's Golden Globe Awards, but in comparison to last year I was kind of underwhelmed. Don't get me wrong I definitely have my favorites, but I just had so many more last year and I feel like there weren't as many 'wow' moments for me in terms of fashion. Below I have put together my favorites from this year to make up The Blush Blonde Golden Globes Best Dressed List. 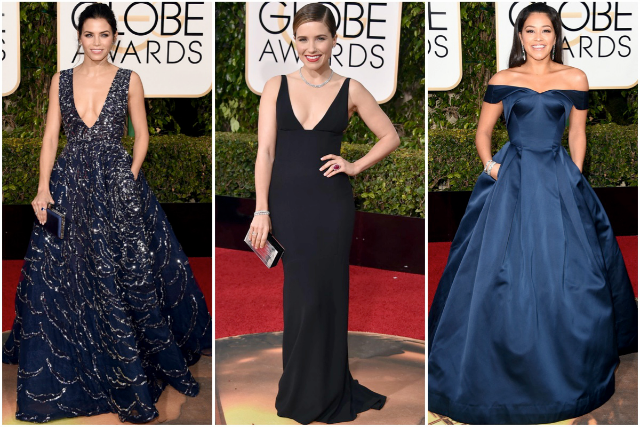 Which look was your favorite at the Golden Globes? Today I'm linking up with Tutu Tuesdays, and Confident Twosday. I missed the show this year, and I was hoping to read a style round-up-- so thank you! Some gorgeous gowns here... I'm in love with Jenna Dewan Tatum's! Kate Hudson looked great, but I just couldn't pick her this year. Crop top and a choker? I just couldn't get on board. Kate Hudson....It's so different, but I really loved it for some reason. She makes bold moves that I enjoy. I feel like J-LAW always rocks it!